When people think of country area rugs, they usually think of rugs with a certain look or feel. Braided area rugs come to mind as the most popular style of rug that has a country look. Originally made from rags and/or material scraps, braided area rugs were used as floor coverings during colonial times and by settlers as they moved westward across the United States. The braided area rugs of recent years are made from a variety of materials, including wool, cotton, nylon, and polypropylene. They come in a wide range of colors and sizes and they’re very durable. Traditional rugs, such as Persian rugs and Oriental rugs usually have more of a formal look, while country area rugs have an informal look and blend right in with almost any type of home decorating. 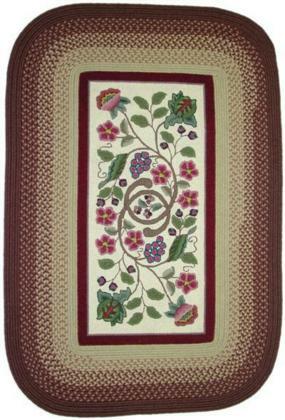 Some country area rugs feature designs with fruits, vegetables, vines or floral designs. Earth tones as well as shades of blue, red, yellow, and green are the colors most often seen in country area rugs, although I have seen braided area rugs with a touch of lime green or hot pink that still have that country feel. Animals are another design feature often seen on country area rugs. It might be a rooster or some other farm animal or a wildlife scene with a duck or a deer. These examples of country area rugs combine two country style elements in one rug. 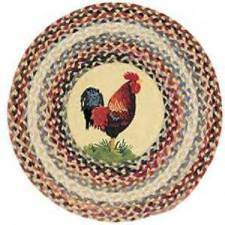 One is a braided area rug with a rooster and the other is a braided area rug with a vine design in the center. Some contemporary style rugs can also be described as country area rugs, since they have a look or overall design that allows them to classified in either category. The same can be said of some Southwestern style rugs. People tend to think a kitchen and/or dining area is the most likely place to see a country area rug, but many of these rugs look great in any room of your home. If you like braided area rugs and want to have that look carry over into other parts of your home decorating, you’ll be glad to know that there are chair pads, trivets, and individual stair treads to match a wide selection of braided rugs. The individual stair treads can be rectangular or a wide oval shape. The chair pads and trivets are available in square or round shapes. You certainly don’t have to live in the country to have a country feel in your home. When you add rugs to your home decorating, you can have any look or feel you want and country area rugs provide just the look that many people find appealing. Braided Rugs Additional information about Braided Area Rugs. Contemporary Style Rugs Many Country Area Rugs fit this category. Indoor-Outdoor Area Rugs You can use these rugs inside or outside! Navajo Rugs Also see History of Navajo Rugs and the "Spirit String." Southwestern Rugs Also see Navajo Rugs.